Many of the world’s leading banks have posted significant increases in earnings so far this year, thanks to an improving global economy and a sharp decline in nonperforming loans. These banks have boosted their capital and are in a stronger financial position to increase lending and underwrite debt and equity issues in the future. Something resembling a return to normality has emerged from the turmoil of the crisis years. Fatter capital cushions could pad the next crash for financial institutions, should it occur, but rising costs are squeezing bank profits in many business lines. Regulatory uncertainties are hanging over the industry. Second-quarter 2011 earnings of US banks were better than expected, but only because expectations were lowered in advance. In reality, the quarter was a relatively weak one, with gains driven primarily by trading results. Depending on how new regulations are written and implemented, these well-intended efforts to stave off the next crisis could end up throwing sand in the gears of the global economy. Bankers say they are spending a lot of time and money just trying to understand and prepare for the new regulatory regime. Meanwhile, the European Banking Authority’s 2011 stress tests failed to provide clarity into where weaknesses lie in the European banking system. For one thing, the implied loss rates assumed by banks in the case of a sovereign default were much lower than those priced into the markets. The tests also failed to consider the ripple effects as a shock passes through the system, creating systemic risk. 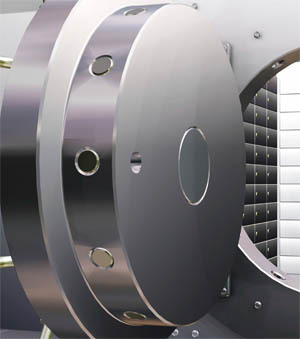 A sound banking system is a necessary prerequisite for a strong economy. Global Finance has identified the best banks in 127 countries and seven regions, as well as the best banks globally in 11 key banking categories. In selecting this year’s winners, Global Finance’s editorial team considered factors that range from the objective to the informed subjective. Objective criteria included growth in assets, profitability, geographic reach, strategic relationships, new business development and product innovation. Subjective criteria included the opinions of equity and credit-rating analysts, banking consultants and others in the industry, as well as corporate and financial executives. The winners are not always the biggest banks but rather the best banks, those with the qualities that corporations should look for when choosing a bank. 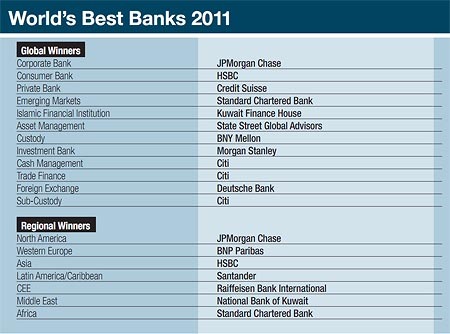 These are banks with the most effective risk-management systems, excellent service and good corporate governance. 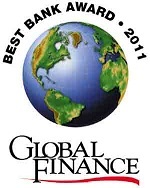 Within this listing of the World’s Best Banks we have included our May 2011 list of the Best Developed Market Banks and Best Emerging Market Banks. We are also announcing for the first time the global winners in several of the categories.